In liver tranplant surgery the diseased liver is removed through an incision made in the upper abdomen. 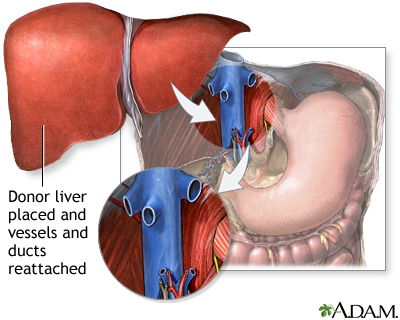 The new liver is put in place and attached to the patient's blood vessels and bile ducts. The healthy liver is obtained from a donor who has recently died but has not suffered liver injury. Liver transplants can save the lives of people who might otherwise die.